A 36-lot neighborhood has been proposed at the northwest corner of 106th Street and Ditch Road, but many nearby residents are opposed to its construction. 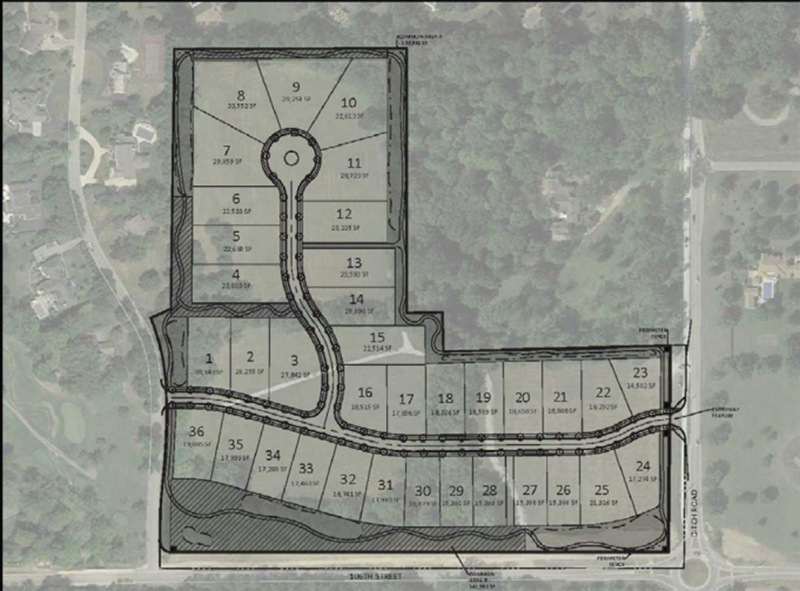 The Carmel Plan Commission reviewed a petition from JJB Development on Nov. 20 to rezone nearly 28 acres from residential zoning to a planned unit development for 36 single-family homes. The site is surrounded by single-family estate homes and the Crooked Stick Golf Course. The PUD proposes a density of 1.3 units per acre on lots that range from 15,300 to 33,533 square feet. Under current zoning, the minimum lot size is 15,000 square feet with a maximum density of one lot per acre. Tim Ochs, an attorney speaking on behalf of JJB Development, said the two developers live in the adjacent Crooked Stick neighborhood and are aiming to provide a high-quality housing option primarily for those looking to downsize. Homes in the proposed neighborhood would be at least 3,000 square feet. More than a dozen nearby residents spoke against the rezoning, with many expressing concerns about the higher density of the proposed neighborhood compared to its surroundings. Bob Thomas, a board member of the nearby Laurel Ridge homeowner’s association, said that all of the 17 lot owners in his neighborhood are “adamantly opposed” to the change. Crooked Stick resident Angela Khan said she owns two properties within a mile of the site and that homeowners choose to live in the area because of the privacy and estate setting. She believes that atmosphere would be diminished if the project is built. Other residents raised concerns about increased traffic and spoke against the proposed neighborhood’s main road connecting to Crooked Stick Lane. Ochs said developers are willing to reconsider the Crooked Stick Lane connection and that the neighborhood isn’t big enough to have a major impact on traffic. A traffic study is under way, he said. Carmel Plan Commissioners offered mixed feedback. Commissioner Tom Kegley described the area as a “very important parcel” with the city is running out of vacant land. “Change is a necessity. It’s something I’ve learned to live with, but we all want change to be done the right way,” he said, adding that he expects another – potentially worse – development proposal to eventually come forward if this one is not approved. Commissioner John Adams questioned why the project is being proposed as a PUD rather than using its existing zoning with variances and asked the topic be discussed in committee. He also said that he doesn’t buy into the proposed target market. “As a person who’s older and has raised a family, this is not the type of home I’m looking for,” he said. The commission voted to send the petition to the residential committee, which will meet Dec. 4. Several changes from the current S-1 zoning are requested in the planned unit development for the proposed neighborhood. Below is a comparison of some of them.